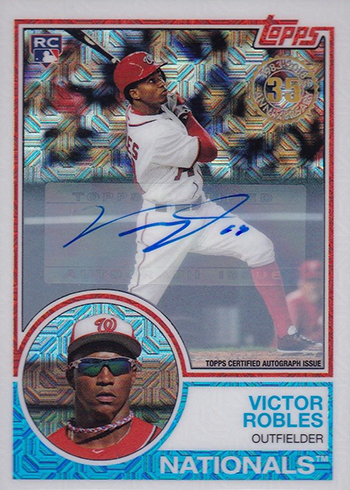 2018 Topps Baseball Silver Packs are a bonus for collectors buying 2018 Topps Series 1 and 2018 Topps Series 2 hobby boxes. The cards are an added incentive, providing exclusive cards not available anywhere else. Special 1983 Topps Silver Pack cards are done in chrome. 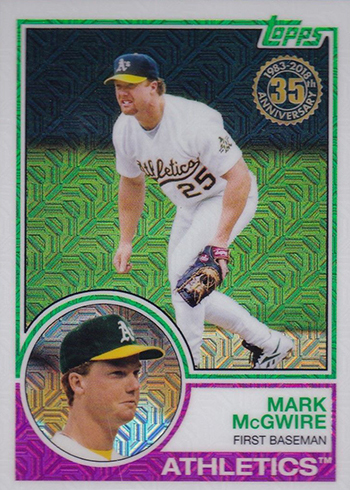 This makes different from the 1983 Topps inserts found in regular packs. The Silver Pack versions also have a patterned background similar to last year’s cards to make them quickly recognizable. For Series 1, the checklist has 50 cards covering superstars, rookies and some big-name retired players. 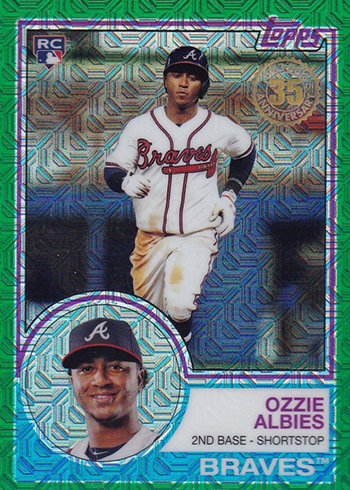 Refractor parallels come in Blue (/150), Green (/99), Purple (/75), Gold (/50), Orange (/25), Red (/5) and Superfractors (1/1). Autographs are also randomly inserted. A total of 40 players have signatures in the bonus packs. Parallels for these include Orange Refractors (/25), Red Refractors (/5) and Superfractors (1/1). This is the second year for the program. 2017 Topps Silver Packs delivered special 1987 Topps Chrome cards. Rather than keeping with the 30th anniversary theme, and moving ahead to 1988, they’re jumping backwards. Although 1988 has its fans, 1983 Topps Baseball is considered by many to not only be one of the most attractive sets of the decade but all-time. 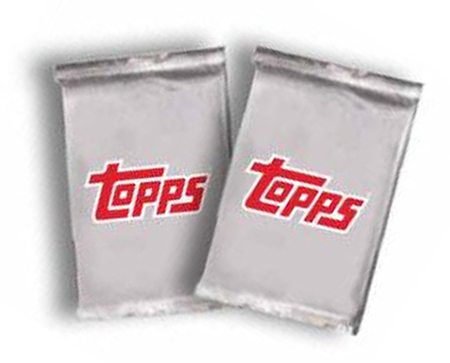 2018 Topps Silver Packs are hobby-only. Collectors buying a 2018 Topps Baseball hobby box from Sports Cards Plus, a.k.a. The Super Hit Factory get one of the special Silver Packs. Hobby JUMBO boxes are good for two Silver Packs. 2018 Topps Series 1 Baseball releases on January 31. The program is scheduled to continue with a second batch of exclusive cards for Series 2. This checklist will expand with the release of 2018 Topps Series 2 Baseball. Known print runs are noted.